On January 6, 2015, California Governor Jerry Brown broke ground on the nation’s first high-speed bullet train project. 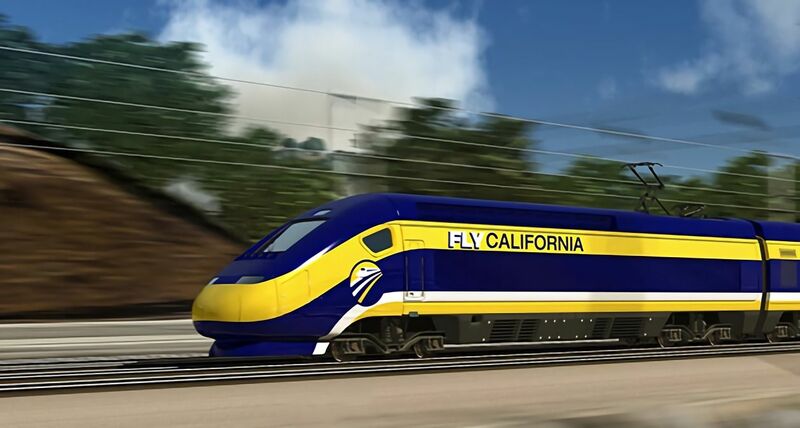 Designed to reduce the expense and time required to cross the large state, the train will carry passengers through the Central Valley at 200 miles per hour. Once the project is complete, the trip from Los Angeles to San Francisco by train will take just 3 hours, less than half the time it currently takes by car. Sleek, aerodynamic bullet trains are popular in Asia and Europe, but California’s massive project is the first to embrace the technology in the United States. It is hoped that the advancement of high-speed rail will aid in the reduction of global warming. Not only will convenient public transportation mean fewer cars on the highway, but the all-electric trains will also run on renewable energy. This week’s symbolic start is just the start of things to come. While the initial phase focuses on a 28-mile stretch between Fresno and Madera, the entire project is much larger. After completion of the initial segment, work will move to a 114-mile segment connecting Fresno to Bakersfield. Eventually, the rail system is expected to cover nearly 800 miles of track connecting Los Angeles and San Francisco with offshoots as far south as San Diego and as far north as Sacramento. The current plans call for the 520 miles between the two major cities to be completed by 2029. 24 stations along the way will provide access to the high-speed train. The cost for the entire project is expected to reach $68 billion. It is also expected that additional business will develop along the rail route, especially near the stations. A large chunk of the $68 billion budget will go to skilled trades workers. This is especially good news for California’s Central Valley where the initial phases of the project will begin. The area was hit hard by the recession and has been slow to recover. Currently, the area faces over 30 percent unemployment, according to the California High-Speed Rail Authority. The project is expected to provide a much-needed boost to the economy. In fact, 620 jobs have already been created during the planning and design phase. As construction moves forward, the need for skilled labor will skyrocket. The California High-Speed Rail Authority anticipates the creation of 20,000 jobs annually for the next five years. The best news is that these will not be jobs that evaporate as the project progresses. As the rail system continues its path through the state, 67,000 skilled workers will be needed annually for the next 15 years to grow and maintain the project. Many of the jobs will be in steel fabrication, welding and pipefitting. Even after California’s high-speed rail system is complete, thousands of permanent workers will be required in both the public and private sectors to operate and maintain the rail system and maintenance yards. Even with the need for skilled trade workers skyrocketing, the people most qualified for and most successful in the positions will be those with professional training from a vocational school. Workers with hands-on training will be ready for real-world situations in the booming high-speed rail industry and elsewhere. Tulsa Welding School provides complete welding training in as little as seven months. A mix of classroom education and interactive workshops, the program covers everything from MIG to high frequency TIG and fluxcore welding. Completion of the trade school program prepares workers for jobs like the high-speed rail project, as well as those in the pipeline and aircraft industries. TWS also offers exciting pipefitter training, which takes just six and a half months to complete. The technical training program covers planning, assembling and installing pipe systems, as well as blueprint reading and safety procedures. Perfect for gearing up for work on the high-speed rail project, this training also prepares workers for careers as steamfitters, pipelayers and boilermakers. For more information on how vocational training can help prepare you for a job on California’s high-speed rail project or in another exciting field, call Tulsa Welding School today.